A majority of Americans (57%) say the higher education system in the United States fails to provide students with good value for the money they and their families spend. Is a college education a good Return On Investment (ROI) for most Americans? Payscale provides college ROI ranking. best provide 30-year net ROI of $1,467,000. while worst have negative ROI. median 30-year net ROI is $65,000. 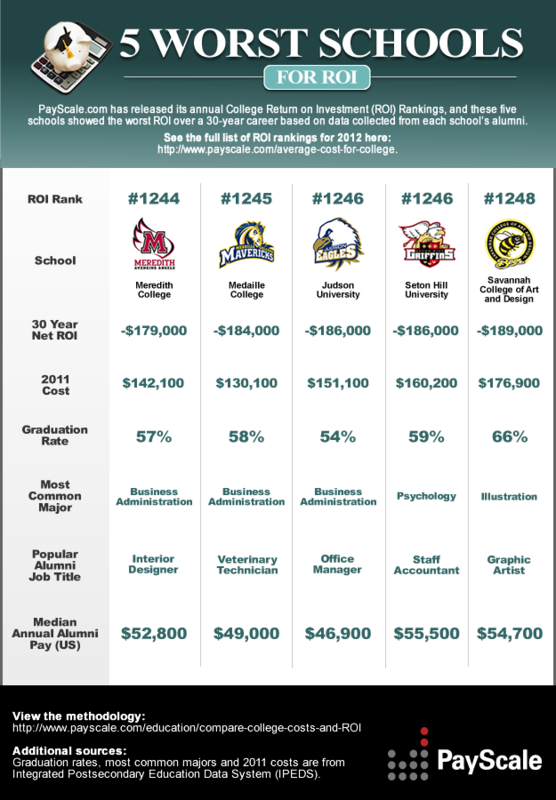 There are 1248 colleges on the list, of which 352 have negative ROI. 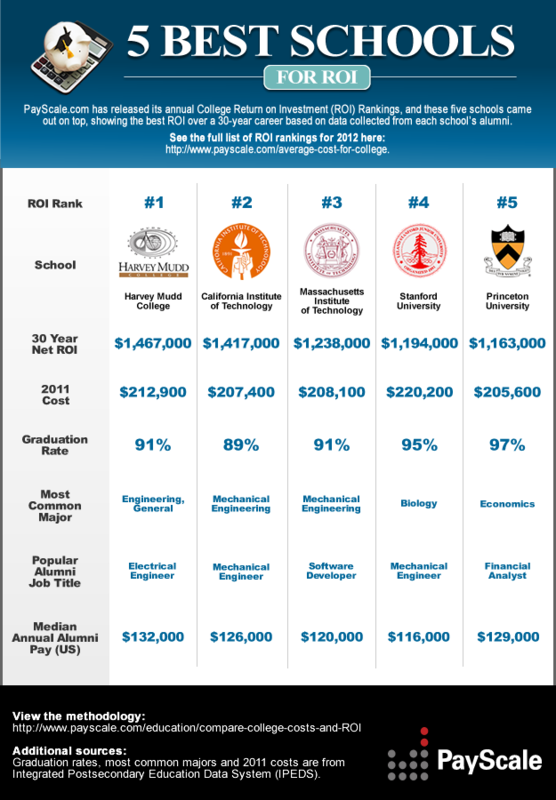 As for doubt "how can negative ROI exceed the cost of the college"? Return from Attending College: The main financial benefit of attending college is the gain in income received by a college graduate over a high school graduate. However, by choosing to attend college, one is giving up four to six years of income one could have received if one went straight to work after high school. Therefore, we calculate the gain in pay over a high school graduate (earnings differential) as the difference between the 30-year median pay for a 2011 bachelor's graduate and weighted 34-36 year 75th percentile pay for a high school graduate. I don't think this can be answered so easily. Vartec's answer looks at earning potential across the board. http://www.pewresearch.org/fact-tank/2015/12/04/education-and-marriage/ Shows that Collage has an effect on marriage longevity. Researchers at the National Center for Health Statistics estimate that 78% of college-educated women who married for the first time between 2006 and 2010 could expect their marriages to last at least 20 years. But among women who have a high school education or less, the share is only 40%. Though some of their findings may be consider coincidence instead of causality. Other factors include Job satisfaction (https://trends.collegeboard.org/education-pays/figures-tables/job-satisfaction-education-level-2008) That shows that Collage graduates are slightly more likely to have a little more "satisfaction" then a few other categories. But, again this may be more subjective then anything. It's also important to note that difference between "High school graduate" and "Bachelors" is minimal. The Centers for Disease Control and Prevention released Wednesday their annual report on health in the United States where statistics showed that, on average, 25-year-olds who received a bachelor's degree had a life expectancy almost nine years longer than those who did not have a high school diploma. But here again the difference is between Not graduating high school and graduating collage. If you look at the linked report you can infer more interesting things. In many cases it comes down to what does the individual think. In my personal experience there are a few jobs for which a degree of one form or another is a requirement, for example Doctors. There are many jobs that only exist to further academics, for example Scientists. Then their are jobs that probably work better with formal education, For example Lawyers. Finally there are jobs that would work more effectively with other types of post secondary education, for Example Software Developer. While a great many jobs need some kind of education beyond the general "stuff" thought at the high school level, I don't think you can actually quantify, on a global scale, the best way to teach those skills, and because you can't quantify that, the value of experience, and the ability of the person to negotiate their "worth", I don't think you can get a good base line on rather or not "Collage is worth it". Everyone has to make their own personal decisions. You can't put a price on happiness, and no matter what a graph tells you, if you feel you need 4 more years of education to be "complete", then skipping it will always be a sore spot. Yes. According to the Bureau of Labor Statistics the median usual weekly earnings increase with increasing level of education, while the unemployment rate declines. 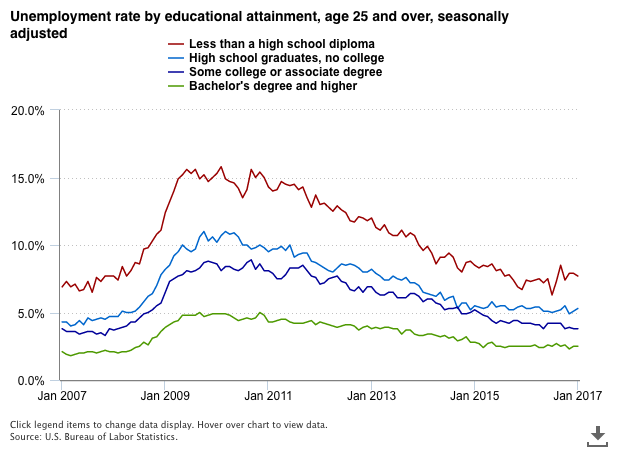 As the graph shows, unemployment rate for people with high school diploma is 1.8 times that of people with bachelor's degree. 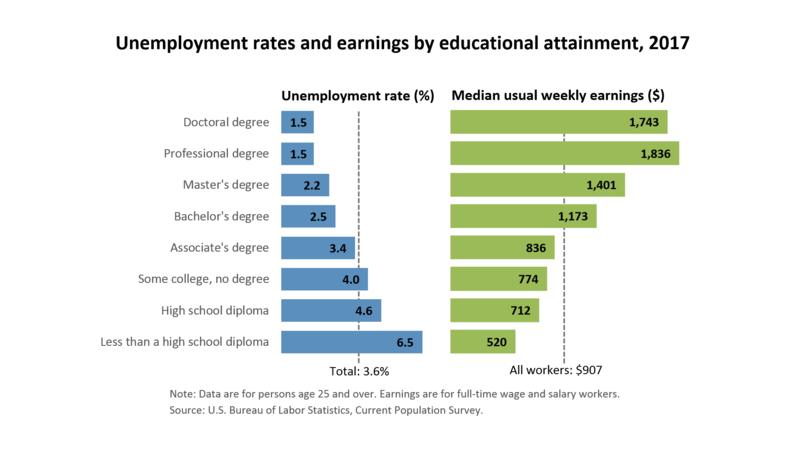 The median weekly earnings are double for bachelor degree holders compared to people with high school diploma. This has been the trend consistently for many years. An interactive version of the chart given above consistently shows unemployment rate for high school graduates roughly double that of college grads. Assuming the median college grand makes $500 more per week than a high school grad, that's ~ $25,000 per year. As per this chart, the average public 4 year college tuition for an in-state student is $9400 per year, for a total of ~ $40,000. Assuming you earn roughly $25,000 more per year, you get your investment back in under 2 years. Even for private college graduates who pay on average $32,400 per year, or roughly $130,000 total, it's still under 6 years to get your investment back. 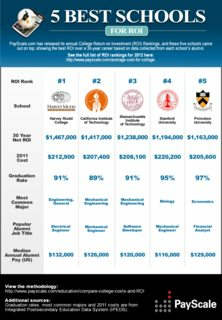 I think it's pretty clear that, for the median college grad, the cost of college is well worth it considering that even someone who payed their way through a private college, without any financial help (grants, scholarships), can recoup their investment in mere 6 years and reap the benefits for another 35+ years. Not the answer you're looking for? Browse other questions tagged united-states education . Are teachers in the United states paid poorly? Does the Veterans Health Administration (VHA) provide higher quality, cheaper care than most other US health systems? Are Americans ignorant about the geography of the world? Is cost the #1 reason why Americans fail to take their medications as prescribed? Does Melania Trump's security cost double the National Endowment for the Arts' budget? Is the total cost of treating the uninsured in emergency rooms more expensive than government-subsidized urgent care would be in the US? Do airlines in North America make around $10 profit per customer?